Do you wonder how much to share with people? And when asked if you are okay do you answer by rote, “Great thanks” but deep inside you want to keel over? Do you need some help or advice but don’t want to appear weak or unknowledgeable? Are you more comfortable asking people how they are rather than telling them how you are? It’s time to move out of your comfort zone. A few weeks ago it was really tough. My two pickles went down with Chicken Pox at the same time. As this happened a big dark cloud arrived over my head. Partly because of the pox but also because I had a lot of other things going on as well. The pox and sleep deprivation meant I didn’t have the usual resolve to send the cloud on its not so merry way. It was very early or late o’clock and I decided to do what any self-respecting mother of two would do when at her wits end. And I kept telling Facebook through the early hours and the next day. I got words of wisdom, tonnes of sympathy, personal messages that made me laugh and mostly I knew I wasn’t alone. Because at stupid o’clock with a screaming baby and no solution I felt very alone. I later told Facebook I was off to the docs and tongue in cheek suggested someone bring me coffee. When I came out I was met with a beautiful smiley face, a hot coffee, a bag of cookies and a warm hug. I dissolved. That kindness gave me the energy I needed to get through the day. Did I feel needy? Undeserving? The cloud over my head at the start of the day had dissolved by the end of the day. The situation hadn’t changed much but people had been immensely kind. There is a difference between being vulnerable and needy. A needy person never gives but constantly demands of others, complains, never seems to try and work it out and are constantly stuck. A vulnerable person has inner strength. They can share their weaknesses and struggles honestly. They aren’t stuck forever they are stuck now. I also learnt that being vulnerable attracts people. I’m not suggesting that you be vulnerable just to attract people because that would be needy. But people are attracted to people who are honest and talk about their stuff openly. People realise that it’s not just them that struggle, others do too. It is hard being that person but it is who I am and it’s a good thing. And finally, cookies can change someone’s mood radically and show them they are not alone. 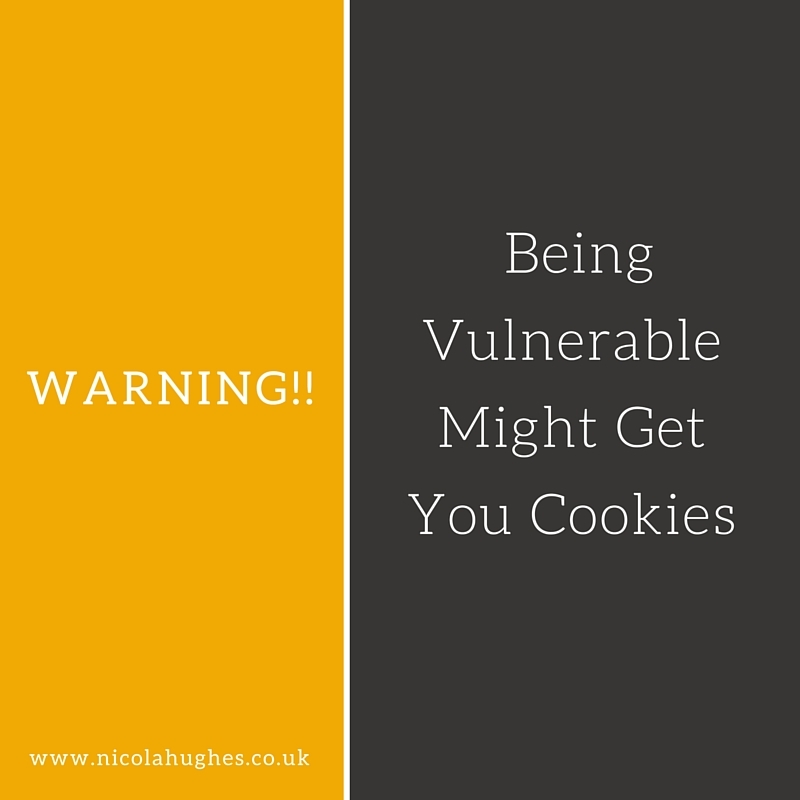 I was so uplifted by my coffee and cookie experience that I decided to pop to a friends with a bag of cookies as I knew she was struggling too. She was so thankful. Her situation didn’t change, she continued to have sleepless nights but knowing someone cared made the day more manageable. So, what are you meant to do with all this information? Go and buy someone some cookies. Honestly, do it! Be vulnerable. I know you have plans to be successful and achieve great things and you think you need to portray strength to do this so people will trust you. You are on a journey. Part of that journey involves being a real person with real stuff going on. Previous If Your Outside Self Is Broken…Read This! Next If the X Factor was the Guilt Factor I’d get to Judges Houses!